There is nothing that’s a bigger black hole of time than getting ready to paint. I’m sure we have our own stories, but by way of example, here’s mine. I paint on one end of a 6’ work table, an area roughly 24” x 28”; the rest is filled with miscellaneous detritus. And even that area must be constantly kept clear by what I call “hacking back the jungle”. I usually try to do this part the night before I plan to paint to save precious time, but even then I can get tripped up by other things. First, there’s paper. If I don’t cut a pile of paper before I get started, I have to spend a good hour setting up the space to do that, then clearing it off. So I try and do this ahead of time, too. Inevitably there’s the missing tube or paint or brush that needs to be hunted for. It’s not like I don’t have a hundred brushes of various types and sizes, but I need that one brush, so off hunting I go. There’s a good hour more. And tube of paint? I easily have a hundred or more of those, too; but I need that particular color and nothing else will do. So let’s see now – where is it? And then there’s just the plain old fritzing around doing things I think need to be done right then: dishes, laundry, plant watering….it’s a long list. I once had a conversation about this issue with another artist and they thought it was either we were reluctant to get to work or we were just ‘warming up’ to the process. Either way, it keeps me from working. I suppose this will be an endless battle for me until I stop letting things get in the way of the process. Oh yeah – I just thought of one more thing: blog posting! Time to wrap this up and get over on the other side of the work table and get to it! Spent a delightful, albeit humid morning painting with an artist friend at Del Rey Lagoon in Playa Del Rey, California. We’ve had a bit of a monsoon flow drifting up from Mexico the past week and this morning it was on full display: magnificent clouds overhead and dark gray horizons. We set up along the bluff overlooking the lagoon and got to work. 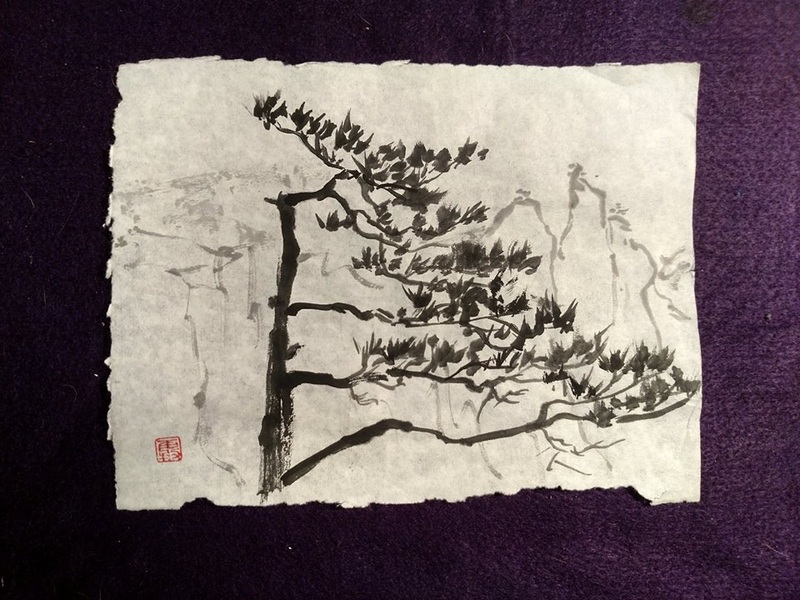 I was using an 11″ x 14″ sheet of Arches 140 lb. cold press paper and one of my watercolor boxes, along with a selection of squirrel mops and rounds. About 3 hours later, after way too much fussing, I had a serviceable painting. It did need some further refinement at home with some gouache though. My challenge lately has been to paint larger, at least some of the time, and I must confess it’s a struggle for me; I find painting smaller pieces to be more manageable. But as they say, nothing comes without effort, so I plan to slog on. Black is Black. Or is it? 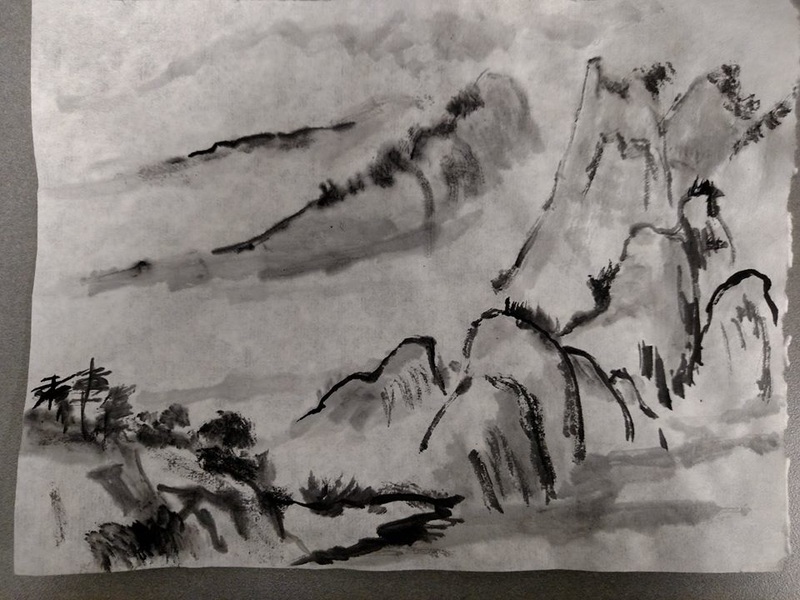 Ivory Black (M. Graham): It’s the black most recommended on most artist’s palettes, but after this test I am wondering why; it is a slightly warm black, especially in the washes. To my eye it almost has a touch of brown to it. Ivory used to be made from – you guessed it – burnt ivory (up to the early 20th century). Perhaps it is the warm tone of that color that has been replicated (without ivory) in the modern version. Lamp Black (M. Graham): This black is, to my eye, a true, solid black, both in the mass tone and washes. Lamp black used to be made from soot, so this accounts for the true black appearance of this pigment. Peach Black (Holbein): A grey-black pigment originally obtained from burnt peach stones. Other early formulations included aniline black and soot from burnt petroleum or wax. According to some sources, the pigment has a tendency to green, making it useful for darkening foliage and ground cover. [Wikipedia]. As far as I can tell by hunting for it myself, Holbein is the only maker of this color. It is a dark black in mass tone and creates nice silvery grey washes. I do not see any greenish cast to it at all, but the Holbein tube does say “harmful if swallowed; contains soluble copper”. The pigment info is PBk1/PBk6, and the color family is orange (!). It carries a California Prop 65 (hazardous) label. Lunar Black (Daniel Smith): Now this one was an oddity upon some sleuthing. On the Blick website the description says “Mars Black”, so I’m not sure if “Lunar” was used to give it a different connotation or what. It is a dark black, and granulates in the washes. I like the effect. Mars Black (Winsor & Newton): I can’t see any discernible difference between this one and the Lunar Black. I think the Daniel Smith is indeed a renamed Mars Black. Chromium Black (Winsor & Newton): This black was something I bought last year as part of a special limited edition set of “twilight” colors. Each tube was only 5ml, and the colors are not available in larger tubes. It was love at first sight, and I have used it a lot since I first bought. It has a reddish tone to it, even in the mass tone; even in the washes it leans towards a brownish red. Not intense, but subtle. I binged bought several tubes of it, fearing it might disappear. And so far the only place I’ve found it is online at stores such as Blick, Jerry’s, and Jackson’s Art (UK). Another pigment worth mentioning is Daniel Smith’s Bloodstone Genuine. It has a similar reddish cast that Chromium Black does, but in the washes it goes to a subtle violet. (I’ve included two paintings I did that primarily features this color). So there you have it – the black roundup. It’s always fun to do these comparisons, because it helps make good (and often interesting) color choices later on. Let me know your thoughts and experiences with your choices for black, as I’d love to hear them. I love those little bushy-tailed rascals a lot, but I also really like brushes made from their tails. I had to really develop a mental block against thinking about where my favorite squirrel mop brushes really come from in order to be comfortable using them (much like not thinking too hard about where bacon comes from). I do like some synthetic hair brushes, and they’ve come a long way with them (especially Escoda brand brushes), but there’s still nothing like the load of pigment that you get with a natural hair brush, nor the way they hold their points under use over the long haul (treat them right, and a natural brush will be your best pal for a long, long time). Recently I purchased my first brush from Rosemary & Co., the handmade brush company based in the UK. I wanted to be able to take a modest sized squirrel mop brush out on location without having to take my treasure selection of Winsor & Newton mops outdoors where they could be lost or damaged. So after some diligent research and review reading, I dropped the $14.14 for a Rosemary R( Pocket Pure Squirrel Hair Mop (med). With fast FedEx shipping from the UK, the total came to $28.26. Today I decided to do a brush comparison of the Rosemary R9 and the Isabey 6202 I picked up about a year ago. For good measure, I also included my favorite Winsor & Newton #00 that I sue most often in the studio. So let’s get to that comparison…. The first thing I thought when I pulled the R9 from the package was that the closed tube was exactly the same size as the Isabey and it made me nervous that I might have just bought a duplicate brush of he same size. But wait: after I wet both of them, I noticed was the fullness of the R9 compared to the 6202. How did they do that? Both come to an excellent point, but the R9 definitely has a fuller belly. I then pulled out my favorite W&N #00 squirrel mop for further comparison, and found that it, too, was close to the size of the others, but there are a few distinct differences. So here’s what I found: I would say the Isabey is close in size to the W&N #00, but with a way fuller belly, so I think that the R9 could probably pass for a size #1 mop, and it holds a tremendous amount of pigment. The wash I got with the Rosemary R9 on the right was an absolutely beautiful thing. The pigment flowed easily from the brush without leaving too big of a pool of dark paint at the end of the stroke (a real plus when you’re trying to lay down a nice sky background. Both brushes handles fine point strokes, with a slight bit better one from the R9. I’d probably use the Isabey in a small sketchbook, around 3.5″ x 5.5″ and the Rosemary might even work up to an 8″ x 10″ sketchbook. Of course this is just a simple, initial testing of the Rosemary brush, and more use will help with a final determination. I’ll post an update in a couple months after it gets some use at the line up of plein air sessions over the next couple months. Summary: The Rosemary & Co. R9 appears to be a quality brush. The hairs are secured by copper wire around a traditional goose quill sheath (I’ll have to contact them to confirm that). Some care will need to be exercised in replacing the brush into the travel cap, and it will have to be put away wet; once dry, the hairs flare out too much and it makes it near impossible to get the cap on without catching stray hairs even by spinning the brush around while doing it. This is not a big deal for me, but others might not be patient or careful enough, and become frustrated by it. Another possibility would be to store it outside the cap when not in use and allowed to stay dry (to avoid mildew and rot of the hairs), and wet it slightly to put the cap on when you’re ready to go out painting. So if you’re looking for a good travel brush to use while painting plein air or urban sketching with small sketch kits, I think you probably could get away with using just this one brush if you want to go small, fast, and light with your kit. Pricing: The Rosemary & Co. sells for $14.14 (+ $14.12 Fed Ex 2-3 day shipping) for a total of $28.26. The Isabey 6202 sells for $35.99 (+ approx. $5.95 shipping) on Cheap Joe’s website. That’s all for this one. Happy painting and have fun out there! Addendum: I tried out the brush some more this afternoon. Did this 5.5 x 8.5 all with the Rosemary mop. It’s a keeper! I love how this brush handles and how much pigment it holds. What a pleasure. This baby is going to see a lot of mileage for a while. If you aren’t acquainted with artist, author, and filmmaker James Gurney, let me just say briefly that he knows what he’s talking about. Gurney has been showing and promoting his art, books, and videos on his blog “Gurney Journey” for many years and it’s safe to say he’s explored the ins and outs of showing and promoting his work effectively. I would, in fact, be surprised to find someone in the art field that hasn’t heard of him. He recently shared what he knows about “Sharing Your Art on Social Media” and I wanted to give a shout out to what a great bunch of tips he had and to give those who aren’t familiar with him an introduction to his wonderful blog. Keep on making art. The world needs to see your vision! I haven’t used gouache much for the past year or so (except zinc white in some of my watercolor paintings), so I thought it was time to drag them out again and take a fresh approach. 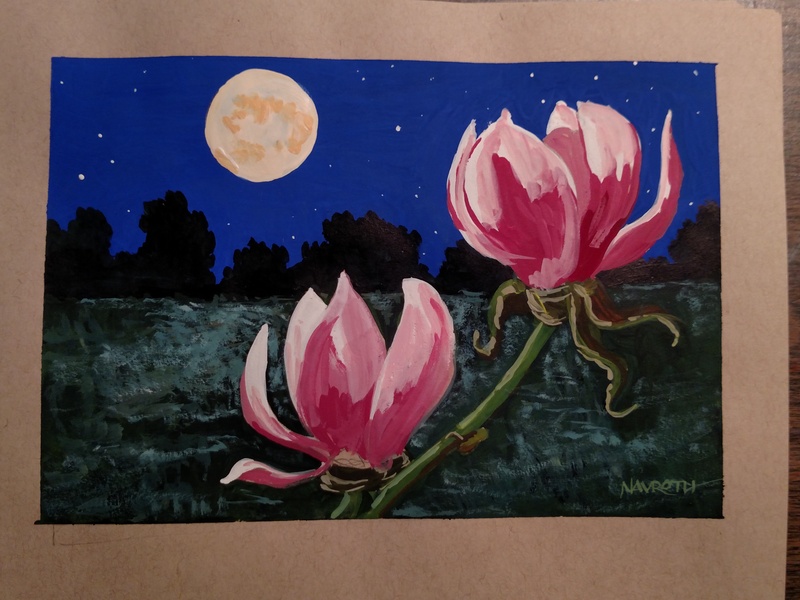 The other day I saw someone using a toned sketchbook for gouache paintings and since I had a couple of them, I thought, “Why not?” I had a photo I liked of some tulip tree blossoms and decided to turn it into a nocturne. Gouache isn’t exactly that easy to use, and to get it the right consistency, the toned paper really helped. I taped off a rectangle with blue painter’s tape (that stuff is like magic for artists) and got to work. I plan to do some more works in gouache. A year or so ago I did a series of seascapes in gouache (including the one on the masthead of this blog) and really enjoyed working with them. But alas, I get distracted easily and was soon off to something else. But this time I hope to stick it out a bit longer and really learn how to handle this medium. Looking for artistic camaraderie? Join a sketch group! Earlier this year a joined a Meetup group, “Freehand Sketchers in Pasadena & LA” for just this reason. 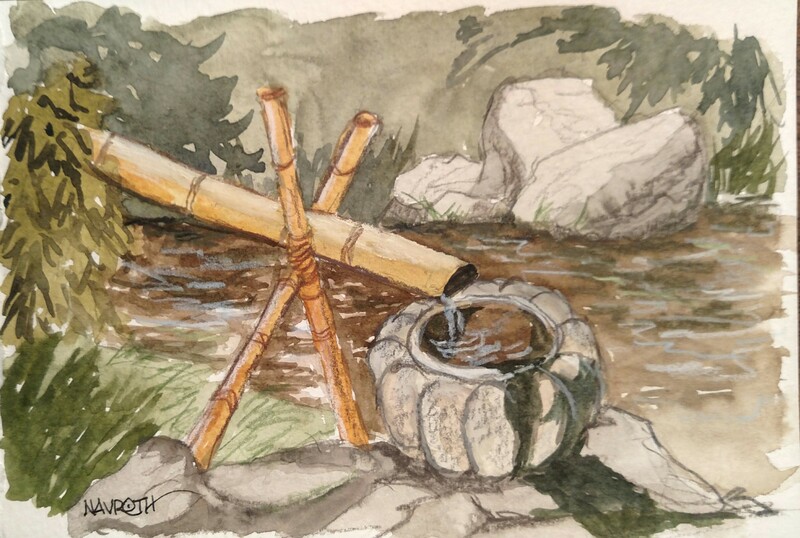 A lot of art is created in solitude, but I’ve always enjoyed being a part of an artistic community, which made me seek out other sketchers and painters on Meetup. My original aspiration was to find a chapter or the Urban Sketchers organization (USK.org), but I found not a single one in Los Angeles. So when I searched for sketching groups, I found the one mentioned above and promptly joined. The first event I went to was at Port ‘o Call in San Pedro. There about 10 or 12 people that day, and all made me feel welcome and were fun to sketch with. (And it was a good thing we went when we did, as Ports ‘o Call is slated for a massive renovation, that will likely remove all the original charm and architecture of the place.) I later found out that many of the events organizers and leaders were actually in Urban Sketchers, so this worked out great. Alas, some life events happened not long afterwards and I missed a lot of the meet-ups, and it wasn’t until last weekend that I joined them again–this time at Descanso Gardens. It was a lovely day and another great group of sketchers. We sketch for a couple hours after arriving, then meet up for lunch and to show our work. Some people also sketch for a while after lunch, which is what I did. I had a wonderful time and met some new people. I did two paintings, but the second one really came out the best. Yesterday we met at Huntington Library in Sierra Madre. Another gorgeous day and a lot of fun sketching. I’m looking forward to more adventures with this group. So if you find yourself wanting to move beyond the solitary, I highly suggest finding a Meetup or Urban Sketchers group near you. They are a great group of talented and fun artists to spend the day with. In this case, a mother Black-necked Stilt and her young wading in a marsh. I’ve been doing some preliminary sketches, color thumbnails, and color sketching prior to starting a large work. I first did some sumi-e style brush sketches of the adult stilts using Chinese ink and watercolor brushes. My goal was to get familiar with the general shape of the bird and some of it’s natural postures. Using pencil, watercolor pencil, and a water brush I set up a composition and did some thumbnails of the young birds. I’ll also be building some maquettes of the birds using aluminum armature wire and Sculpey polymer clay. This way I can study the birds at all angles, and can deduce the proper lighting effects on a 3-D object. The end product will be a 13″ x 10″ oil painting on illustration board (that has been treated with Liquitex matte medium). This is a technique that artist and illustrator James Gurney uses with fantastic results. The use of the smooth illustration board and the random textures that can be laid down with acrylic modeling paste on top of the matte medium allows for some interesting effects, and is easier to paint on that canvas. I’ll post photos and more information as this project goes along. 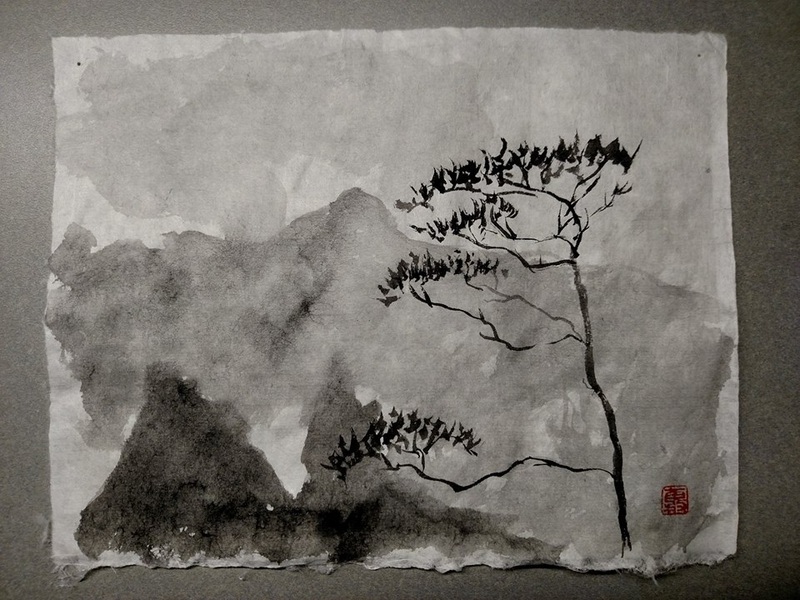 I’m always up for exploring new art media and tried out Chinese brush painting late last year. 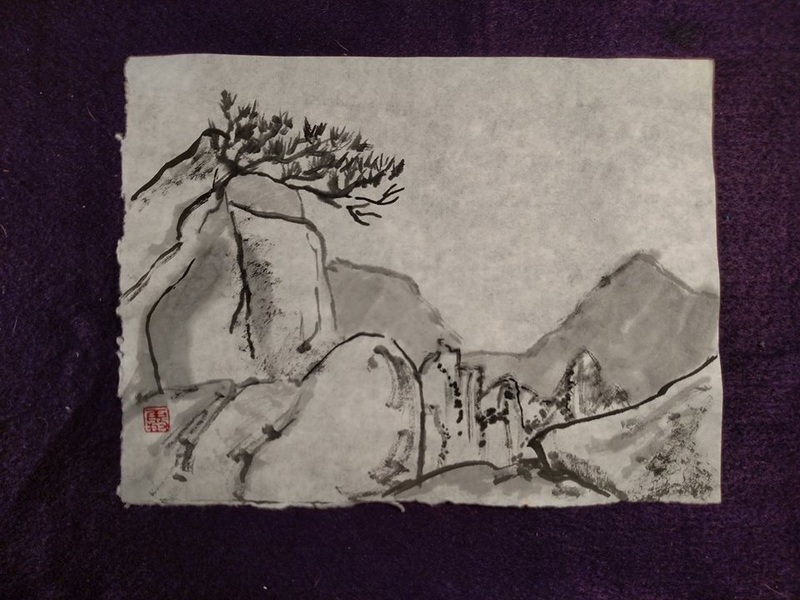 I used a couple of different piston brush pens (they fill with water, like a fountain pen), a re-wetable ink cake, and some rice paper. 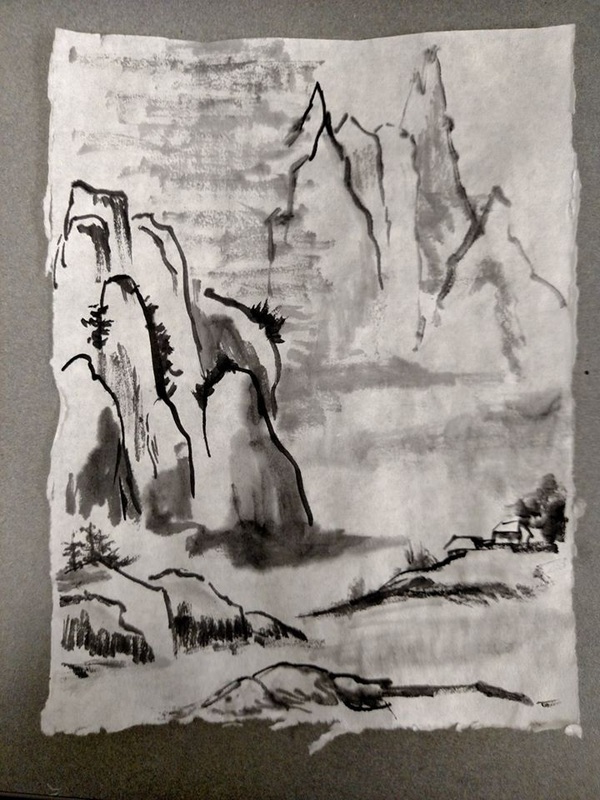 For subjects I tried using some landscape photos and gave them an Asian spin, and looked at a lot of ancient Chinese artwork for inspiration. It’s not an easy medium, and you have to be willing to live with a bit of chance, but that’s what makes it interesting. Never be afraid to try something new–you may find something you really like, or something you can add to your existing media to give it another dimension. Here’s the links to supplies to do this–great prices and customer service! It happens to every artist sooner or later, and usually many times during one’s career: the artistic slump. I used to freak out when I had them, worried that I’d never draw or paint again. But after many years, I’ve learned that they pass, and very likely with renewed excitement and vigor to begin again. I liken my slumps to being in a chrysalis. 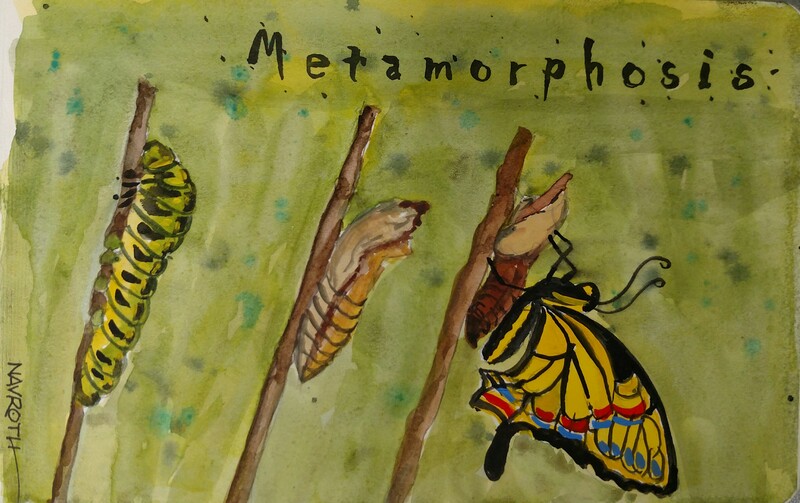 I am wrapped up, unable to move; then all of a sudden, I break free and am able to fly again–a metamorphosis, if you will. It’s not fun when you’re in them, but they do pass. I just roll with it and do other things, none of it art-related. Everyone will deal with it in their own way. I finally just got sick of the inactivity and started watching some art videos. That finally helped it along. It’s such a great feeling to pick up a brush again and push the paint around! If you find yourself in one of these awful situations, don’t despair–and don’t give up. I think these fallow periods are a way for us to rest ourselves and renew our spirit.